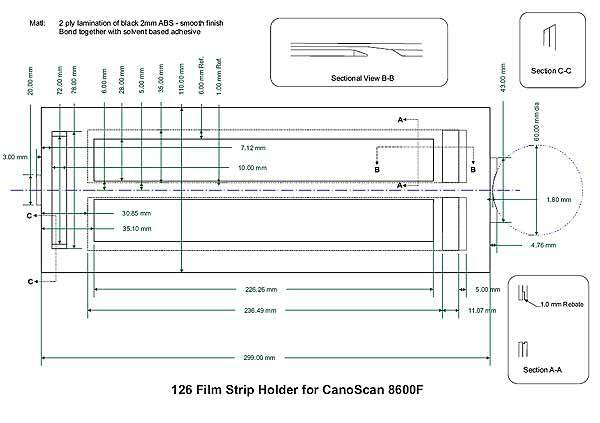 The Canon CanoScan 8600F scanner offers flatbed film scanning and excellent value for money. Whilst it may lack the ultimate resolution of dedicated film scanners, it is well suited to the scanning of the old negative films where the camera and lens were not the best, and colour negative film had not been developed to the standard offered by today’s best films. I have found it more than adequate for scanning my (mainly poor quality) film archive, but it can provide scans of a quality approaching the images from my Canon 350D. The 8600F is supplied with film holders for 35mm film strip, 120 film, and mounted slides. A problem arises with 126 film strip, which although being on 35mm film stock has a wider image than a normal 35mm negative. The standard 35mm film holder cuts off 4mm from the top of the image. Although for small numbers of negatives they can be fixed directly to the scanner glass, it is not convenient for more than a few negatives. Fixing to the glass also leads to marks on the glass, from fingerprints and tape residue, if it is used to hold the negatives in position. I tried to find a 3rd party 126 film holder but failed to find any for the Canon. The solution was to make a dedicated 126 film holder specifically for the 8600F. Because the image on a 126 film is wider than a 35mm image it extends to within 1mm of the film edge. This small edge zone makes it difficult to retain the film in a holder by simple hinged frames clamping down on the filmstrip. A 1mm strip of plastic would be too flexible and too weak to be a practical solution. I therefore decided to base the design on the principle of the film sliding into a 35mm wide slot. Although sliding the negatives has a risk of scratching the image surface, in practice it is not a problem due to careful design of the film retaining slot lead-in, and by achieving a smooth surface finish. The risk of scratching is probably lower than that of the development process. A design was developed to be feasible using only simple power tools and common hand tools. The finished 126 film holder is shown in the photo above, or as a downloadable high-resolution photo here, in which the details of the film slot can be seen. 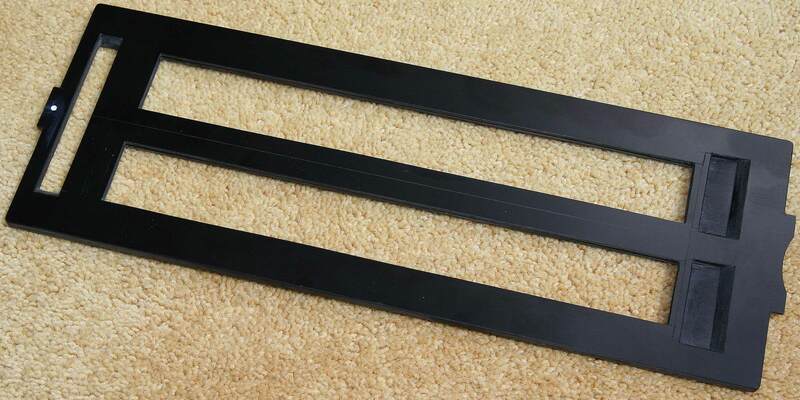 It is made from two pieces of 2mm black ABS sheet, which is readily available, easy to work, and yet has the necessary strength and rigidity for normal use. The two pieces of ABS are arranged as a lamination, with the lower part rebated to form a film retention slot when the upper lamination is bonded to the lower. A large slot is obviously provided for the scanning window, and other slots are cut for scanner lamp calibration and filmstrip insertion. The result does not look out of place alongside the standard Canon film holders. Full size working drawings are available for download here, and detailed manufacturing instructions are here. Anyone used to making small parts, such as scale models, would find the manufacture well within their capabilities. The most difficult part of its manufacture is accurately cutting the rebates, which guide and retain the film. With care, planning, and perhaps some test pieces, it would be within the capabilities of anyone used to small power and simple hand tools, although parts of it may require a couple of attempts! Good luck and happy scanning of those memorable, old and irreplaceable pictures. Black, smooth finish, 2mm ABS sheet. Flat-ended router bit 6mm dia. – must be sharp! All credits to the construction, images and words goes to John Fowler.